Rockabilly Hall of Fame Inductee #301, James Homer Kirkland was born at home on May 15, 1934 in Linden, Texas. Before playing the bass, Kirkland played the mandolin, fiddle, and guitar. None of them made him feel at ease; that is until he discovered the upright bass. He joined his high school band, and the Army surplus had donated an aluminum standup bass among other instruments to the school. As soon as he picked it up, he knew it was his natural instrument. Soon after, he was playing in honky tonks. The year was 1949, and the musicians at Bud's Night Spot in Rodessa, Louisiana liked him so much that they hired him on the spot. "They were some of the finest musicians I played with in my entire life." Unfortunately, the gig only lasted a few weeks because someone from school had seen him playing and told on him. He wasn't allowed to take the instrument off school property, let alone make money playing it. Kirkland was devastated. He talked his mom into buying a second hand one for $75. He played night and day. The blisters, bleeding, and calluses he incurred only fueled his desire for playing the bass. He took the bass to Shreveport and had a guy paint it lavender, his mother's favorite color. Without him knowing, the guy decided to spice it up a bit by adding glitter. While the bass was on its side drying, he added white paint near the F-holes and sprinkled silver glitter on the wet paint. He then added Kirkland's name at the bottom in white script letters, which also had silver glitter. Kirkland attended Ouathita College in Arkadelphia, Arkansas for a short time in 1954. He had won three scholarships for three different majors: ministry, music, and boxing. He quit in February 1955 as he couldn't concentrate on schoolwork. His mind was on music, so he went back playing in the same honky tonk that he started in. He played anywhere to make a dollar, loved music that much. In 1956, he met a man from Virginia by the name of Curly Johns. He was stationed at the Air Force Base in Bossier City, Louisiana. He was mesmerized by his playing technique. He pestered him until he relented to show him a few of his tricks. Johns told him he had to pay someone $500 to have the tricks taught to him, but he would show Kirkland for free under one condition, he would only show him once. Kirkland kept a captive eye on him, and he memorized every lick. Before that, he was playing double slap just like Bill Black. On the way home with his dad in their pickup truck, Kirkland started banging on the padded dashboard. His dad inquired what he was up to, and his reply was that he was playing what he had just been taught by Johns. By the time they got home, Kirkland was eager to try out his new tricks. He went through the routine once, and he learned he had made a mistake. Knowing which mistake he had made, he corrected it and was perfect the second time around. Johns was instrumental in helping him to develop his playing technique. Eventually, combining what he already knew with his newfound expertise made him a better player than Johns. In fact, most rockabilly fans will cite Kirkland as one of their all-time favorite bass players. Also in 1956, Kirkland made his first recordings at radio station KCIJ in Shreveport with Johnny Horton. Sonny Jones played guitar. 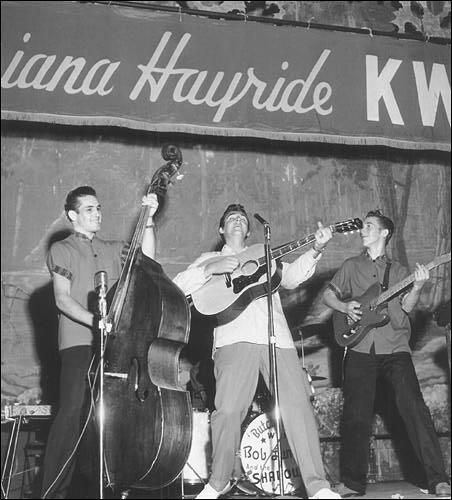 "Honky Tonk Man" and "One Woman Man" were two of the first rockabilly songs ever recorded. These were demos. They were later re-recorded in Nashville with another band. Around that same time, Kirkland played a few shows with Dale Hawkins at the It'll Do club in Bossier City, Louisiana and then went with him to New Orleans to do a show and recording session. David Houston was working on the Louisiana Hayride and decided to hire Kirkland as his new bassist. Kirkland would make $12.65 for a Saturday night performance as a staff member of the Hayride. 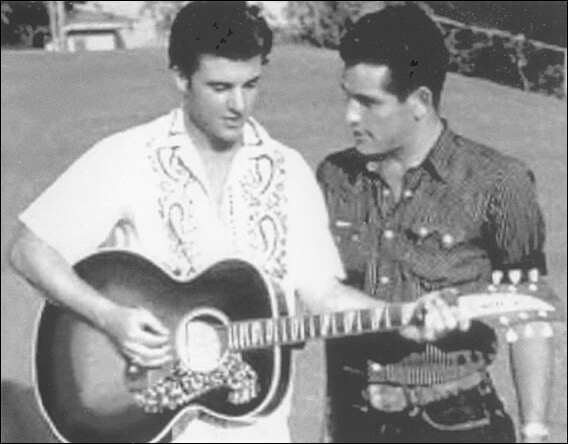 The Louisiana Hayride would also be the place that Kirkland would make fast friends with Bob Luman and James Burton. The next person that Kirkland worked with was Bob Luman. He worked with Houston for only six months. Luman, who had replaced Elvis Presley's run at the Hayride, was just starting to gain a following and get hot when he decided to take his talent to California. He convinced Burton and Kirkland to join him. Kirkland begged him not to leave the good thing he had in Shreveport, but Luman felt there was more money and more fame to be had in California. On their way to Hollywood, they stopped to do their last performance for the Louisiana Hayride in Corpus Christi, Texas on May 31, 1957. Horace Logan had secured them a movie contract for the B movie Carnival Rock. Production started in June 1957. Billed as The Shadows, Burton and Kirkland not only backed Luman but David Houston as well. The movie was awful, but it showcased Burton and Kirkland's uninhibited playing style. In years to come, the movie would gain a cult following amongst rockabilly enthusiasts. Luman is at his best singing "All Night Long" and "This is the Night," and then there's the instrumental "The Creep." Houston would sing "One and Only." Amazingly, Kirkland has saved those two tone grey shirts that he wore in the movie. He commented that they fit like a glove, hard to get on but even harder to get off. At the same time as Carnival Rock, Burton and Kirkland also appeared in a movie with David Houston. As far as I can tell, the name of that movie is Teenage Thunder. Kirkland says the name rings a bell. In September 1957, Luman, Kirkland, and Burton moved back to California and started recording for Lew Chudd and Imperial Records. He would record "Red Hot," "Blue Days, Black Nights," "Red Cadillac and a Black Mustache" with Burton and Kirkland. 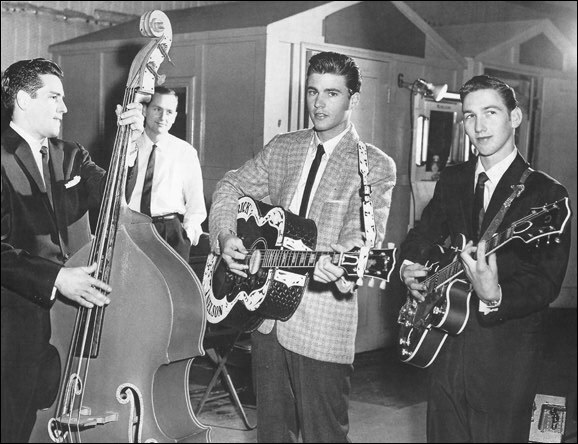 While running through some songs, Ricky Nelson came into the Imperial offices and overheard Luman's band, and decided that he wanted the band for himself. Nelson had done a few recordings for the mostly Jazz record label, Verve, and he had used Joe Maphis and studio musicians for his first album at Imperial. 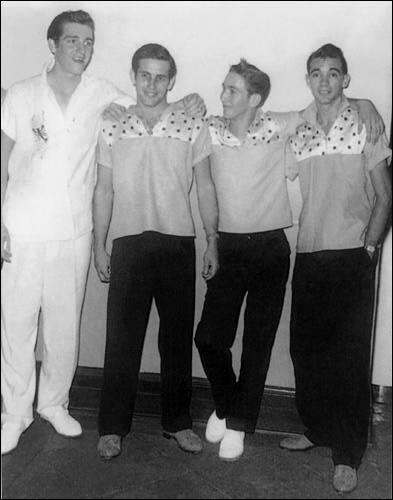 In November 1957, Kirkland and Burton along with Richie Frost did two shows with Nelson in California before going home for the holidays. These two shows would be the only time that Kirkland would play his upright live. He always used his electric since it was easier to transport. Without Luman or Kirkland being aware, Burton had already signed on with Nelson. It wouldn't be until January 1958 that Kirkland would be contacted and asked to sign a contract. Kirkland knew it meant more money for him, but it was difficult for him to leave Luman. "I had rather take a beating than to tell Bob I was leaving him." His loyalty was with him. Luman understood it was a great opportunity for them, and there was never any animosity between him and his musicians or with Nelson. Once the holidays were over, Nelson and his new band went to work. Most historians have cited that the "Believe What You Say/My Bucket's Got a Hole In It" session was Kirkland and Burton's first appearance with Nelson on record. This is not true. The first record they ever appeared on was the double sided hit "Stood Up/Waitin' In School." Burton and Kirkland fit Nelson's singing style perfectly. They had the rockabilly formula down pat, and they would end up breaking Frank Sinatra's attendance record at the Steel Pier in Atlantic City. Once at a show in Indianapolis, Kirkland and a bodyguard were getting off an elevator when two girls came after them. Kirkland remembers it well as his favorite red shirt was torn to shreds that day. I can see how they would mistake him for Nelson. He was a good looking guy too. When they first joined Nelson's band, they didn't realize that they would also be making television appearances as Nelson's band on his family's sitcom The Adventures of Ozzie and Harriet. Upon this realization that he would be on television, Kirkland became pretty nervous. He was afraid that he would make a mistake while on camera. Luckily for him, they would be playing but not live. Nelson would lip sync the songs to a pre recorded recording of the week's song(s). The band was playing, but the viewer didn't hear it since they were playing along to a record. There was a studio right next to the one where they recorded the show, so in between scenes, Nelson would go over there, and he and the band would run through songs that they wanted to record. At Imperial, Kirkland didn't use an amplifier on the recordings; he used two microphones (one at the top and one at the bottom of his bass). Nelson was recorded on one track, Burton on the second, and Kirkland, Richie Frost (drums), and Gene Garth (piano) were on the third. The songs were recorded live in three hour sessions. The Jordanaires overdubbed their vocals in Nashville. His bass playing is identifiable by the clicking sound. The only solo he had is the intro on "One of These Mornings." Kirkland would appear on several episodes highlighting Nelson's latest songs. 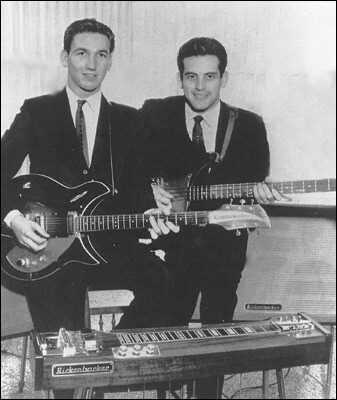 During his stint on the show, he and Burton were Rickenbacker endorsers. He would also co-write two songs for Nelson: "There Goes My Baby" with James Burton and "Be True to Me" with Nat Stuckey. Prior to recording "Shirley Lee" with Nelson, Kirkland and Burton were also on Bobby Lee Trammell's version. For the filming of Rio Bravo, Kirkland and Burton traveled with Nelson to Tucson, Arizona. The Nelsons acted as his own family. He said that Harriet was closer to him than his own mother. He really thought a lot of them. Ozzie had perfect pitch and was an excellent businessman. He was a nice guy too. All of the Nelsons were good people. Kirkland ate many times at their house, and they treated him as a member of their family. 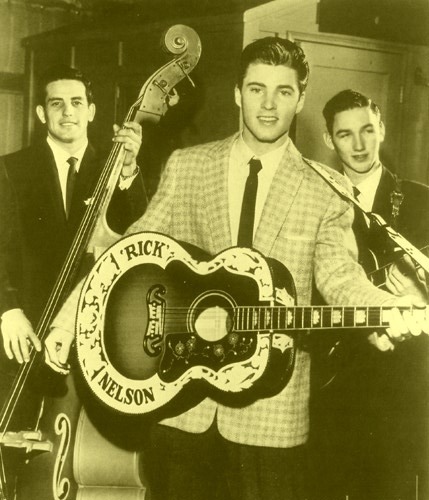 In fact, Ricky Nelson was best man at Kirkland's first marriage. After Kirkland left Nelson in early 1960, he went back to work for Bob Luman for a short time. Joe Osborn who had replaced Kirkland the first time around with Luman went to work for Nelson after Kirkland quit him. He left Nelson because he wasn't allowed to work with anyone else, and there was too much off time. He wanted to play more shows, not just sit around and do nothing. Burton left Nelson at the same time as Kirkland. They went to Vegas to work with Luman at the Showboat. Burton and Kirkland then went to Los Angeles to record an instrumental album for Warner Bros. Burton's mother wouldn't sign the contract as he was underage, so the deal fell through. Burton returned to work for Nelson. Kirkland stayed on, and they hired Lucky Clark to play guitar. Those shows with Clark were the first time Kirkland sang lead on a song. Unfortunately, their stint didn't last long as Luman was drafted into the Army. 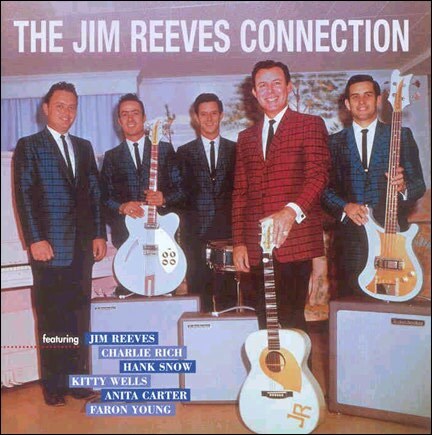 When Luman got drafted, Kirkland along with Luman's drummer Mel Rogers and piano player Dean Manuel went to work for Jim Reeves in Nashville. He would stay with him for three years. He was the first to play electric bass on the Grand Old Opry, and he was the first one to introduce Jim Reeves as Gentleman Jim Reeves. Not only did Kirkland have to play bass in the band but also come up with a comedy routine. He said that was harder than rehearsal, to come up with jokes that he thought the audience would find funny. He even traded insults with Reeves. It was the hit of the show, and after he left, the comedy routine no longer worked. Kirkland opened the show for Reeves every night. He would sing, and then Reeves would be introduced. Having once been a boxer provided Kirkland with the tools he would need to break up any hecklers at a show. He commented that he would always win, but sometimes it would take him awhile, and more often than not he would have to change clothes before returning to the stage. He had to do work offstage too, driving Reeves' tour bus. All of the stress and wear and tear took a toll on his health. His weight plummeted to 120, once having weighed 180 pounds. He knew it was time to get off the road or die. Shortly before Reeves got killed in a plane crash, Kirkland got an invitation to return to work for him, but he declined. Nashville had left a bitter taste in Kirkland's mouth, too much politics and ego trips. When he left Nashville, he left his Rickenbacker electric bass and amplifier in Reeves' basement. He returned home to Texas discouraged but would play the occasional jam session or club. In 1983, he retired completely from the music business. He had grown tired of the rat race; making a vow he would never play music again. He had his own welding business and wanted to stay close to his family. He has three sons and has been married to his beautiful wife Jeanine for twenty-three years. Kirkland hasn't played rockabilly music in over forty years, and he figured he had been forgotten about. It's just been recently that fans have had the chance to talk to him, and he is considering playing live again. Kirkland is very versatile and can play any musical style including rock and roll, blues, jazz, country, gospel, and old standards. 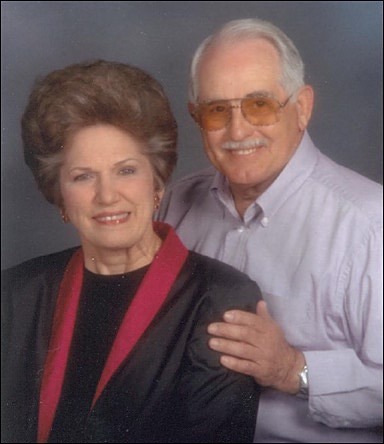 He is very active in his church and has regular jam sessions with friends there in his town of Athens, Texas. He still owns the bass he used on the recording of "Believe What You Say," which happens to be both his and Nelson's favorite song. He doesn't care much for the music of today, especially country music, which he considers to be more pop music than anything else. One of his hobbies includes riding and tending horses. There is a MySpace page set up for Kirkland at www.myspace.com/bassistjameskirkland, so you can send him a message, or you can write him a fan letter at James Kirkland, Box 1208, Athens, TX 75751. I know he appreciates every one of you and would love to hear from you.